Put an exquisite angel right in your guests' hands with these precious angel design curio boxes from Fashioncraft's Heavenly Favors Collection. Ready to be filled with jewelry, coins or any other treasure once your guests take them home, each measures 3" x 2.75" x 1" and is made of sturdy poly resin in a silver/pewter finish. 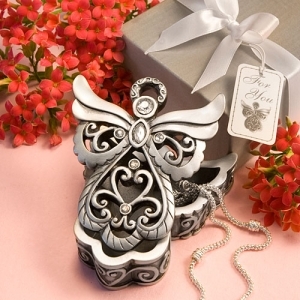 Each angel shaped box has a solid filigree base with a removable cover that has a detailed angel design with filigree swirls and assorted shaped rhinestone enhancements for extra pizzaz. Sure to make a stunning presentation, each comes in a satin finish silver box, tied with a white satin bow and an attached angel themed "For You" tag.